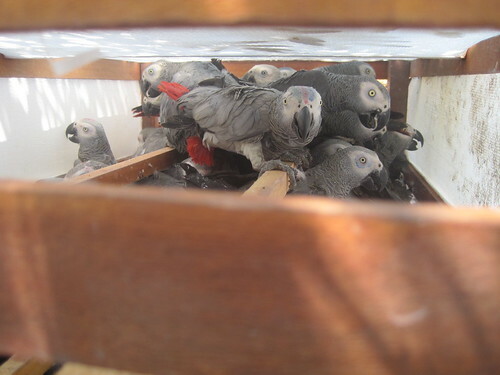 I was just sent these pictures of a shipment of parrots through Kindu. 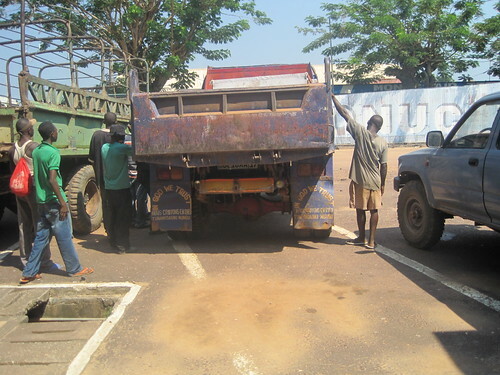 The top crate was visible in the trailer bed when the truck pulled into the parking area of the Kindu airport. The crates had open slats on two sides. Inside–perhaps with their fates already painted on their faces–the parrots looked less than at ease. This shipment probably includes birds collected near Katopa camp. There may well have been other collectors as well. The forest is large, and now it is a little quieter. Thankyou Salumu for the photos! 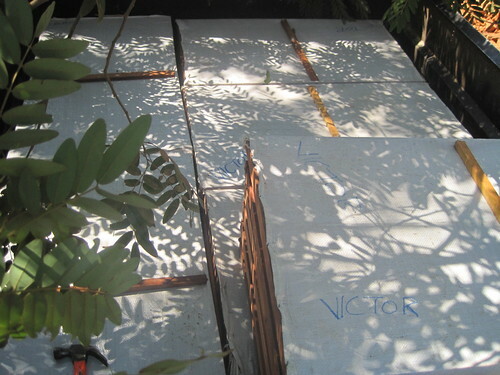 This entry was written by Terese Hart, posted on 2010-06-23 at 7:39 pm, filed under Kindu. Bookmark the permalink. Follow any comments here with the RSS feed for this post. Post a comment or leave a trackback: Trackback URL. Ninety percent of these poor parrots will die before they ever reach their destination! What are the names of these perrots again? Didn’t the IUCN warn that this species was being threatened by exports from Central africa onto Europe and other places? These are the African Grey Parrot or Psittacus erithacus. And yes the species has disappeared from whole areas of forest where it used to occur. Depressing. I wonder where these parrots are going? Not to the the E.U. or the U.S., I trust, which have importation bans. Asia? Very depressing. We first became aware of parrot hunters in the north of the TL2 when a “parrot barge” came as far south as Obenge on the Lomami River. These last two posts are from the south of the TL2 area. We feel that it is urgent to learn more about parrot congregations and how “heavy” this collecting is. How much forest is being emptied? Frankly, I know almost nothing about the external parrot market. I would not be surprised, though, if a significant market was opening up in Asia. Hope you can write a short note on this and the pigeon culling for Bird Conservation International or Bulletin of the African Bird Club or similar. Getting something into Bull ABC would also bring your Lomami project to the attention of itinerant Afrotropical birders and, trust me, birders and twitchers will be amongst the first and most consistent visitors to the proposed park, all important for its potential viability etc. Best regards, Greg. What you say is sooo true. Publishing has been one of our weakest points. Hey there is a new species of monkey that we still have not published!! I do hope that we can get this out. Hello I am having difficulty understanding what I am looking at. Are you involved in halting this transport of the birds, or did you obtain these photos covertly simply to share them? How did you come upon this set of photos? I find them particularly disturbing, the greys look hungry thirsty and tired with circles around their eyes and mouths open. Not normal at all. Why have you posted these photos, please? What is your purpose? Thanks. ps, I understand they are being poached. What was done about it? Anything? The parrot trapper that we knew about on the ground has left (after trapping how many parrots??). Now there are two park guards at our camp that will give us a greater ability to keep trappers from getting set up. 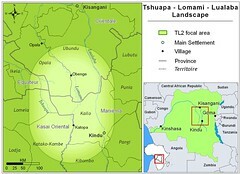 It is a huge area of forest we are trying to protect, though, and we just discovered a new “parrot” roost further north. We are pretty sure that the reason these trappers are here is that they have “trapped” out the forest they come from which is a western province. All I can see, is the desperation and stress in these poor birds eyes. How would these people look if they were sealed in a box for hours on end?